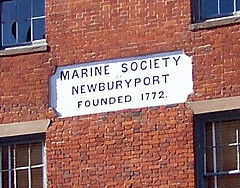 In front of you on the second floor is the Newburyport Marine Society sign. Here, ship captains began the museum of curiosities that they brought back from around the world. Now walk up State Street and turn right on Pleasant Street. Stop at the white church on the right, and begin stop 3.